This small and new winery in the Upper Galilee has been the talk of the Upper Galilee since its inaugural 2004 release. Why you may ask? Well like all these small wineries popping up across the beautiful expanse of Israel’s landscape – this winery is a boutique winery that produces Cabernet Sauvignon, Merlot, and Port like wines. But what makes this winery so very special – is that it is 100% organic. Organic wines have been gaining in popularity for some time now. To explain briefly there is a difference between organic wine and wine made from organically grown grapes. The major difference is sulfites. Wine made with sulfites cannot be deemed organic. However, the grapes can be organic as long as they follow Agrior’s guidelines for growing wine grapes. So what is Sulfites? They are nothing more then a preservative for wine. They were added into wine staring in the last century or so. Before then people got along fine without using them – why? Because sulfites occur naturally in wine. The extra sulfites one may add allow for the wine to stay on the shelf or in the cellar longer. So most wine makers that bottle organic wine will say that white wines should be drunk within the year and within the day of opening it. Red wines have a bit more life to them – 5 years or so, as sulfites are far more prevalent in red wines. Many wineries have wines made of organically grown grapes – this is a trend that according to Uri Rapp (one of the owners of Bashan Winery) is growing. Grapes that make up Yarden’s Odem Chardonnay are grown organically, and so are many more. Why? Uri says because it is healthier for the land, the people who tend the land and finally – the people who enjoy his wine. We met Uri at the winery on a cold winter day. He explained that the idea for a winery started in 1999 between himself and the other owner of the winery – Emanuel Dassa. In 2000 they planted 20 dunam of grapes close to the winery in Avnei Eitan. The vineyards are rich in basaltic soil and have an elevation of 450m. Of course to grow the vines organically – no pesticides, chemicals, or fertilizer. Only organic products are used in maintaining the vineyards, and Uri hopes that this attention to the land and the vines, will allow his children and grand-children to harvest grapes from these very vines for a long time to come. The winery is a converted milking shed from a dairy farm that Uri helped run until 2001. After that Uri turned his attentions to wine making and built the winery with proper equipment for fermenting, aging, and bottling wine. Currently production is at around 7,000 bottles with plans to get that number up to 80 thousand bottles. It is this hands on approach and the attention to detail that has many people talking about the winery and about the future of organic wines and vineyards in Israel. We would like to thank Uri for his hospitality and time when visiting his winery. Following are the tasting notes which we sampled at the winery. The nose on this electric Bordeaux red colored wine is filled with figs and black fruit. The mouth of this full bodied wine has ripe raspberry, sour cherry, and oak notes. The finish is long and satisfying. The tannins balance well with the acid and allow the fruit to come through in the finish. 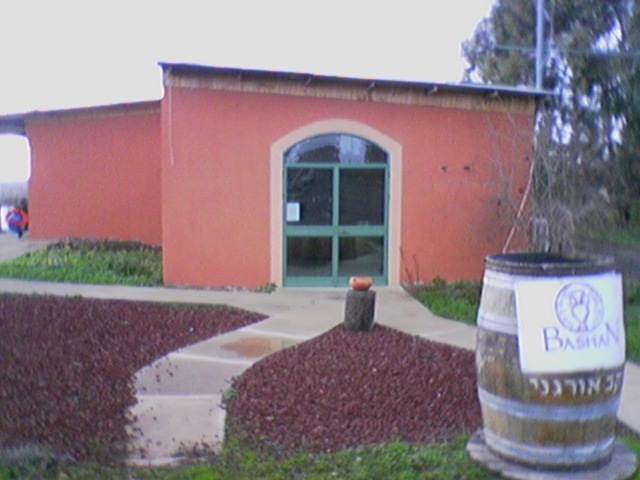 Posted on February 5, 2008, in Kosher Red Wine, Wine, Winery Visit and tagged Bashan Winery, Cabernet Sauvignon, Cabernet Sauvignon Eitan, Odem Vineyard, Ogranic Wine, Organic Food, Sulfites, Upper Galilee, Yarden Winery. Bookmark the permalink. 6 Comments. I am a migraine sufferer and have not had wine for 10 years, due sulfites. Recently in Israel a wine merchant put my on to Bashan. If you know of any more organic kosher wines please let me know. I have a few friends as well who get migraines from drinking wine. Sulfites are known to stuff up your nasal passages and can lead to things like migraines or other ailments. As explained above red wine has sulfites naturally in the wine, while white wines have far less. Unfortunately, they are the only kosher wine that is 100% organic – as of now. White wine requires more sulfites to be added , but still have a lower sulfites ration – and could be experimented with – carefully, to see if they are acceptable to your predicament.